2. Date/Marry Wisely. If someone clearly doesn't like kids then don't date/marry them. You HAVE kids and you can't change that. You also can't change someone's opinion of kids by forcing them to be around yours. The majority of the time this will backfire and your kid(s) will pay the price. While dating, don't bring every person into their lives. Kids, especially younger ones, have a tendency to love someone very easily. And when it doesn't work out, they are heartbroken just as easily. Do you really think it's fair to expect your kids to go on an emotional roller coaster ride like that?! A final note on this one is that you need to know who a person is before you trust them around your kids. Too many times I have read a story about a child seriously injured or killed while around someone that the mother/father was dating for only a short time. Treat them just like you would a stranger until you know they are safe to be around your kids. And if you find that they become emotionally or physically abusive to your kids after the fact, ALWAYS stick by your kids. You are their protector and they should always be able to rely on YOU to protect them. Nothing else in the world should override that! NOTHING! 3. Do Not Badmouth the Other Parent: Divorce is emotionally difficult. It's a roller-coaster of emotions and depending on the reason for the divorce, it can leave one or both spouses angry and bitter. However, there is a time and place to express how you feel and in front of the kids is not it. Your kids do not need to know that you think their Daddy is cheap or that Mommy cheated on you. They don't need to know that you hate their other parent. Why? Because that's their Mommy/Daddy and they love them. Do you think telling your children bad things about the other parent will make them love you most? If so, then think again. Yes, maybe while they are young, they will believe you. But, they will grow up and when they do, they will be able to see that those things are not true. And there's a good chance you will become the least favorite parent. Fun fact: Adults don't like liars. Kids grow into adults. So, if you want a strong and lasting relationship with your kid(s), leave the badmouthing for the late night chats with your friends. 4. Don't Play the "One Up" Game: It's easy in this situation to become competitive with the other parent. You go from working together to be the best for your children to working against one another to prove you are better than the other. It doesn't have to be this way. This goes back to the importance of good communication. Here's a real-life scenario: Mother provides everything her daughter needs and showers her daughter with tons of love. She provides a safe, non-threatening environment to live in, with a stepfather who is just as loving as though she is his own child. On the other hand, the girl's father showers her with elaborate gifts and money. He doesn't make an effort to provide a safe and loving environment for his child when he marries a woman who clearly doesn't care for kids and spends the next 10+ years treating his daughter terribly. Which one do you think this child, who is now grown up, has a strong and ever lasting relationship with? It's not the father, trust me. Money and gifts only go so far. Kids need love and a safe environment in which to live and grow. That's what they will remember when they grow up, not the extra money you threw at them to get them to visit you. 5. Consistent Rules: As a child, there were few things worse than the fact that I had very different rules and expectations between my two homes. In one, the expectations were very clear and realistic. In the other, they were fuzzy and unpredictable. In one home I was allowed to be who I wanted to be and in the other I was expected to conform to judgmental standards. It's extremely important that there is consistency between the two homes. It not only will help you be a better parent, but it will help your child grow and develop naturally and normally. Just because you aren't under the same roof, doesn't mean you can forget all the best parenting techniques. Consistency can be maintained across households and will benefit everyone. 6. Maintain a Consistent Schedule: When you find a schedule that works for you and your kids, try to stick to it. As we all know, kids thrive on schedules. Kids really rely on predictability to be able to emotional control themselves and focus on being kids instead of worrying about what's coming next. Yes, there will be times when you need to divert from the standard schedule. Just try to make these a few as possible and your kids will settle into your new living arrangements easier. 7. Remember that Your Kids Didn't Choose This: As your journey into co-parenting as divorced parents begins, remember that your kids have immature brains that take longer to process this new "normal". While you and your spouse may have been thinking about this and planning for it for months/years, your kids haven't and they are going to have a few bad days. There will be days they wish that one of you dies so they don't have to go back and forth, or they wish you never got divorced. But, if you follow the tips above, these days will become far less and less as time goes on and they will settle into this new routine. 8. Allow Your Kids to Talk to the Other Parent: Your child wants to call mommy every night to say goodnight? Of course they do! That's their mommy and they love them! Why would you ever deny a child the right to talk to their mommy/daddy? (unless they would be harmed by it of course). Kids love their parents and they need to know, when they are at one home, the other parent is okay without them and still loves them. Again, this isn't about who's the favorite parent. It's about the kids and their needs should always come first. Not allowing them to talk to the other parent when they need to will only backfire in the future. They won't forget that feeling EVER! Trust me! 9. Do Your Best: Every day, think about the way you are approaching the situation and decide if you are doing your best. If not, then write down where you think you are falling short and find a better way to meet your expectations. As time goes on and your kids grow up and life changes, you will need to adjust. Having personal insight and flexibility will help you grow towards a better tomorrow. 10. Love Them Unconditionally. Hopefully, I don't need to explain this one. It's important no matter the situation. 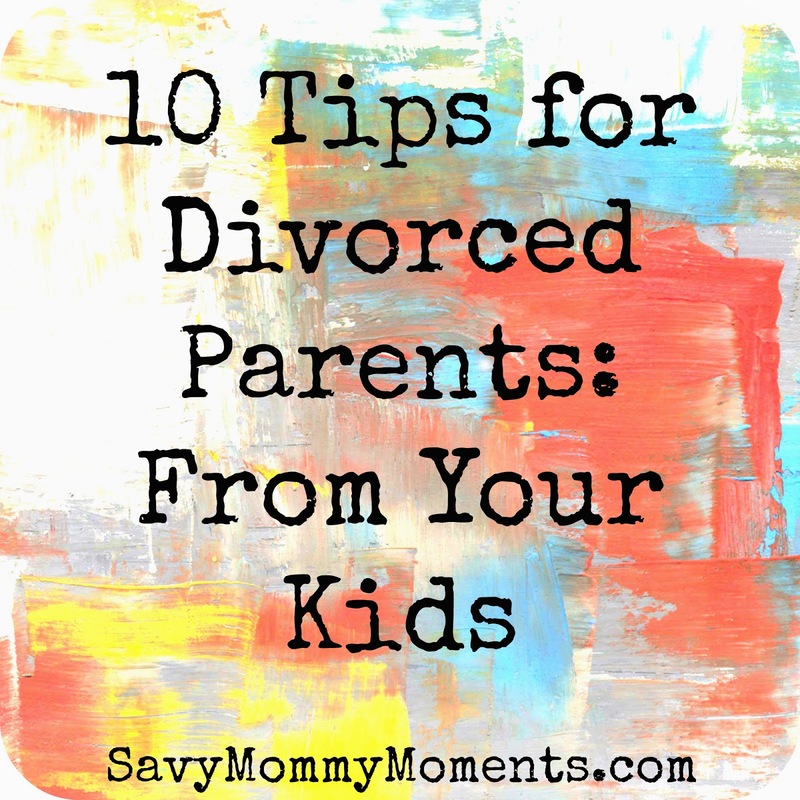 At the end of the day, being a child of divorce is not easy. If I could go back, I wouldn't have it any other way. My parents made a decision that was the best for them and me. And in return, I have a beautiful, ever-lasting relationship with my mother. She is my best friend and the one person who has always protected me. I have gained a man (my stepfather) who is loving, caring, hard-working, strong, and everything I could ask for in a father and grandfather to my children. Every situation is different and these are my tips based on my experiences. Please take a moment to share with anyone you know could benefit from reading these. If you are a child of divorce or a divorced parent and want to reach out to me for support or with questions, please comment below. We are all in this world to help one another. Thanks for reading!